School Boards lead so students can achieve; individual board members are citizens who serve children and represent their communities. It takes strong schools to build a strong community. School Board Members are accountable to the community and strongly advocate continuous improvement in student learning. School Board Members spend countless hours of unpaid time working to provide what is best for students and education. While they wear many hats in the workday world, school board members put on a collective hat when they get down to the business of leading our school district. They devote time in board meetings, seminars and training sessions to keep abreast of the latest trends in educational leadership, are deeply involved in community activities, and spend many hours in the schools and at extracurricular activities. These people unselfishly contribute their time and talents towards the advancement of public education. Their love of learning, concern and caring for students, staff and the community, drive board members’ desire to lead so students can achieve. Thank you to the following Board Members for your extraordinary dedication, selfless service, leadership, wisdom and commitment to providing the best education to our students. We are grateful for all that you do for Wayne Local Schools and the Waynesville community. 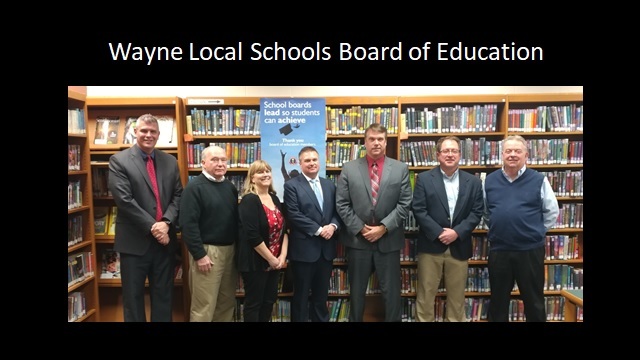 Pictured from left to right: Superintendent Pat Dubbs, David Barton, Susan Blair, Brad Conner, Darren Amburgy, Dr. Jim Byers, and Treasurer Ron James.